Slack was founded in 2014 and no business application has ever grown faster. Slacks boasts over eight million daily active users and has been used by over 500,000 organizations including 65 companies on the Fortune 100. Over 70,000 organizations pay to use some of Slack’s advance features such as voice and video conferencing, unlimited app integration, unlimited searchable messages and more. It’s no surprise that Slack has seen such great success as it is easy to use and has quickly positioned itself as a must-have for organizations both big and small to ensure clear and consistent communication. It functions both as an app for your phone and desktop. The primary function of Slack is as a messaging app in which multiple channels can be set up with applicable members added to channels relevant to them. For example, our Slack consists of channels like Accounting, Brainstorming, Website, Marketing and even some light-hearted channels such as Sports-Talk and Food-Orders. For larger projects, we dedicate a channel to the project itself, assigning all members involved with the project to the channel. The purpose of the different channels is to keep conversations organized and on topic. It’s far too common for conversations to stray off track, become cluttered or convoluted in email threads or group texts. Slack alleviates these breakdowns in communication and helps you and your team stay on track and on topic. You can also send direct messages to anyone on the team regardless of their channel affiliation. For more tips and tricks on how to use Slack, check out this article from Time Doctor. There are a multitude of handy features to be utilized within each channel. You can pin important comments or information to the channel for quick and easy access in the future. As aforementioned, you can even search each channel for relevant key words to find a comment that occurred days, weeks or even years earlier. When using a channel that may include multiple topics of discussion within it, you can set the channel topic at the top of the page to ensure everyone is focused on the same thing. You can even tag specific members or the entire channel in a post or comment to draw their attention to it specifically. Of course, one of the most important features is the ability to add content such as photos, videos, PDFs and more. Once a file is added to slack, anyone in the channel may download it. It’s also easy to navigate files you or other members of the channel have uploaded. Aside from the numerous capabilities within a Slack channel, there are over 1,500 apps and integrations that can be used within Slack. They even created a fund “to support teams building products on top of Slack that enable simpler, more pleasant, and more productive workplaces.” We utilize several of these apps and integrations. 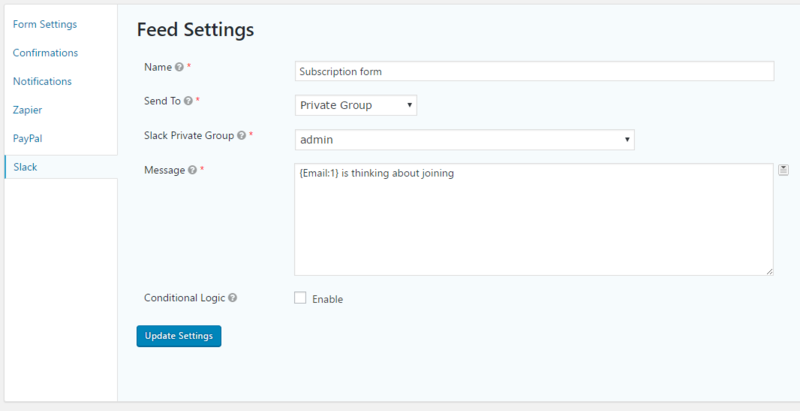 We use Gravity Forms for the form on our website’s contact page and it’s integration with Slack has it automatically send a message to a designated channel when the form is filled out. The contents of this message are customizable and we have it setup to include the full text of the form in the Slack message. We also utilize Polly, an app that allows you to post a poll within a channel that members can vote on. Our favorite, and ironically most used app integration is Giphy. You’ve probably used Giphy before to send a gif in a text or post on social media and it’s function is similar within Slack. Most importantly, for us as a digital media production company, is it’s integration with Google Drive which allows for quick and easy file sharing within Slack itself. These apps are only the tip of the iceberg when it comes to the unlimited possibilities available within Slack now and in the future. In any business or organization, communication is arguably the most pivotal factor in facilitating success or failure. 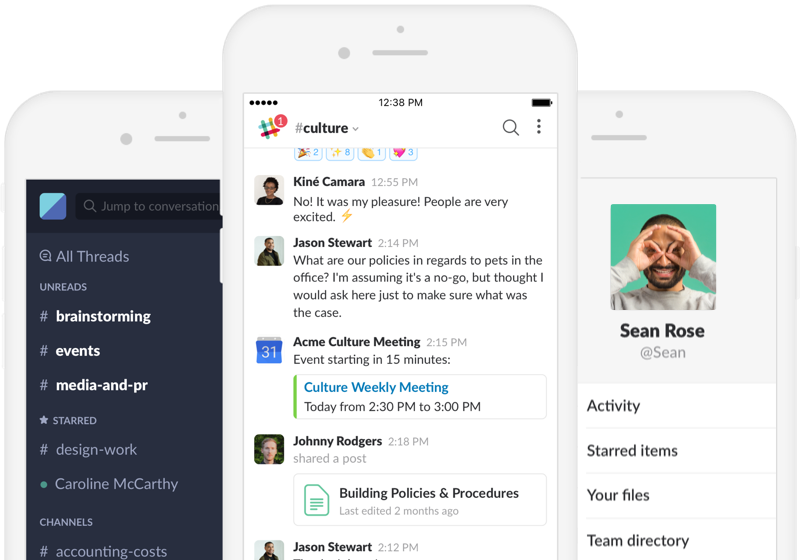 While Slack doesn’t replace texts, phone calls or emails, it does streamline communication within an organization. We have used it daily since our inception back in 2016 and can’t imagine operating without it. We have sent over 100,000 messages on Slack at the time of writing this article and can’t wait to send 100,000 more.